Do you wish you could add curl to your stubbornly straight lashes but find that mechanical eyelash curlers don’t do the trick? Are you flummoxed by false lashes or are you too impatient to sit through getting lash extensions? Then a lash lift could be just the treatment for you! Here are the answers to some of the most frequently asked questions about lash lifts. What is a lash lift? How does it differ from eyelash extensions? A lash lift is a semi-permanent lift and curl of your natural lashes, much like a perm. By bending your natural lashes over a curved silicone shield and applying a perming solution, a lash technician can set the shape of your natural lashes into an upward and realistic curl. Taking into account your natural lash length and your desired look (i.e. straight up lashes or more fanned out), the lash technician will choose from a variety of silicone shield sizes to customize your lash lift. The end result will leave you with beautifully curled and defined lashes. Unlike a lash lift, eyelash extensions are artificial eyelashes that are added to your natural lashes to extend their length and thickness. You can customize your desired look from natural to dramatic by selecting from a wide variety of lash lengths, curls, and thicknesses. At Silhouette, we offer both lash lifts and eyelash extensions. Our experienced lash technicians would be happy to discuss our two services with you to help you choose the best one for your desired look. How is the lash lotion applied? First, the lash technician will cleanse your lashes. Then, she will separate your bottom lashes from your top lashes and apply a silicone shield on top of your eyelid with a gentle adhesive to keep it in place. She will gently comb your top lashes upward onto the shield and fix them in place with more adhesive. Finally, she will apply the eye-safe perming lotion to your upper lashes. The lotion acts by softening the bond of the hair so it becomes moldable to the desired shape. How long does it take to complete a lash lift? Depending on the thickness of your hair, the perming lotion is left on your lashes anywhere from ten to 25 minutes. (If you have naturally straight, hard-to-curl hair on your head, be sure to let your lash technician know prior to the appointment so the perming time can be adjusted accordingly). After the perming lotion has been left on your lashes for the required amount of time, the lash technician will wipe away the lotion and apply a setting solution for another ten to 25 minutes to restructure the lash bond and lock in the curl. Finally, she will apply a nourishing lotion to condition and hydrate the lashes. The entire lash lift treatment takes approximately fifty minutes from start to finish. When performed by trained and experienced lash technicians, lash lifts are extremely safe. The perming lotion we use at Silhouette is safe, gentle, fast-acting, and cream-based, making application easy to control. 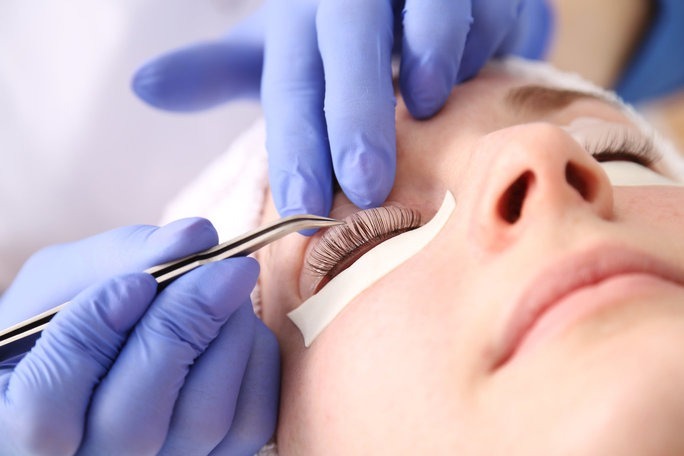 During the treatment, your eyes are covered on both the top and bottom with protectors. The perming lotion and setting solution are carefully applied to the eyelashes, not to the skin. If for some reason these lotions come into contact with the skin or eye, they can be wiped away and flushed with water. If you have skin sensitivities, your lash technician can perform a patch test at least 48 hours before your appointment to ensure that you won’t have any adverse skin reactions during the treatment. How should I prepare for my lash lift appointment? How can I maintain my lash lift? In order to keep your lashes looking their best, we recommend that you condition your lashes by applying a moisturizer such as coconut oil or a facial oil nightly. Otherwise, lash lifts are very low maintenance and require no specific aftercare. The results of a lash lift typically last between four to six weeks depending on the growth cycle of your lashes. As your permed lashes naturally shed, straight lashes will grow out behind them. Therefore, we recommend a lash re-perm after six weeks to maintain results. Can I wear mascara on my lifted lashes? You are free to use whatever eye makeup (including mascara) you like after having a lash lift. However, you should wait 24 hours following your treatment before applying any eye makeup. Can I combine a lash lift with a lash tint? Absolutely! For those who would like to add depth and darkness to their lashes, we offer combination lash lifting and lash tinting services. A combination lash lift and tinting treatment takes one hour and fifteen minutes. The results of a lash tint typically last three weeks. Our price for a lash lift is $80. To combine a lash lift with a tint, our price is $95. Are you ready to give lash lifting a try? If so, please reach out to our experienced lash technicians for more information or to book an appointment. We would be glad to assist you!